Heavy bags stands are great for supplementing and sharpening your boxing skills outside of class. It is also an excellent stress reliever and exercise tool as well. This review article checks out the Everlast Dual Station Heavy Bag Stand Bundle. This Everlast heavy bag supports a 100 lb. heavy bag on one side and the other side has a speed bag platform. You can buy the the heavy bag stand by itself and add the components separately or you can buy the bundle which includes the 100 lb. heavy bag as well as the speed bag. 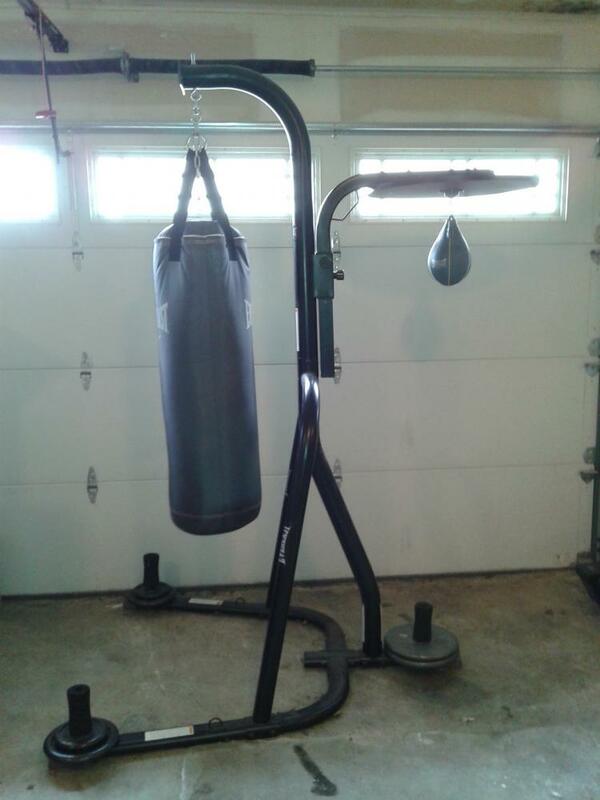 Among the in-home boxing choices like the traditional method of hanging a heavy bag from the ceiling or a freestanding heavy bag, this is heavy bag stand from Everlast is worth checking out and more details are mentioned below. The following is a gathering of the general consensus from a wide range of users as well as the aggregate rating of the product on Amazon. In the second section, we will provide our own rating, pros and cons, as well as our thoughts based on our personal experience of the product. The following section is our personal review of the product after some moderate usage. Everything from hereon is our personal opinion of the product. Metal Construction: The structure of the stand consists of hollow metal tubings that is light enough to move around, yet strong enough to support and withstand a heavy bag that weighs up to a 100 lbs. Dimensions: 66.5" L x 47.6" W x 86.2"
Weight Plate Pegs: The base of the heavy bag stand has 3 pegs that allows you to stack weight plates to secure the stand in place when you are using it. Otherwise, the stand will slide when there is not enough weights placed on the pegs. To maximize stability, Everlast recommends that each peg holds a total of 75 lbs. These pegs are designed for plates with a 1 inch diameter slot. *Note: Weight plates have to be purchase separately. Heavy Bag: The heavy bag that came with my Everlast’s Dual Station Stand was a standard pre-filled 100 lb. heavy bag that simply needs to be hang in place. My heavy bag has a tough canvas exterior shell. I believe the more recent models utilized a synthetic leather material instead. Heavy Bag Chain: A metal chain can be attached to the heavy bag which allows you to raise and lower the height of the heavy bag. Speed Bag Platform: The speed bag platform is connected to a metal bar that allows the user to adjust the height that is appropriate for them. To adjust the height, there are two knobs to keep the platform in place. A grip bar is also available to help with this process. Speed Bag: Everlast Everhide Speed Bag came with the bundle package. It is a medium size speed bag with a synthetic leather exterior. This speed bag requires an air pump to inflate it. Rubber Feet: Each foot of the stand has a rubber end attached. These rubber components will help to prevent the metal base from scraping against the floor. 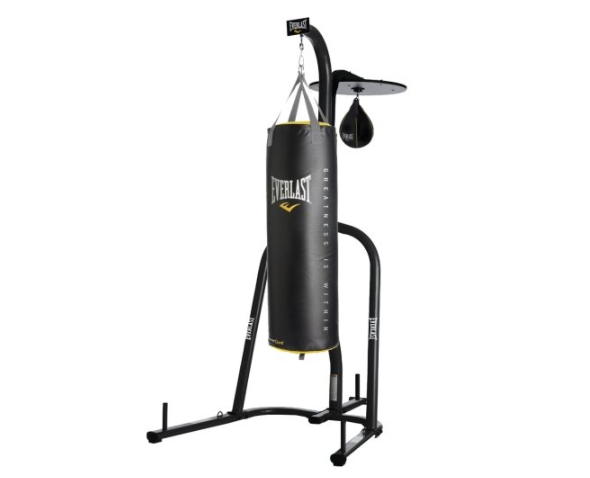 The Everlast Heavy Bag Stand is designed to be easily assembled by a single individual. Of course, it is definitely faster and easier to complete when there is a helping hand. The package came with all the tools necessary to assemble it. However, having your own tool set will be helpful and speed up the process. My heavy bag stand is set up in the garage. 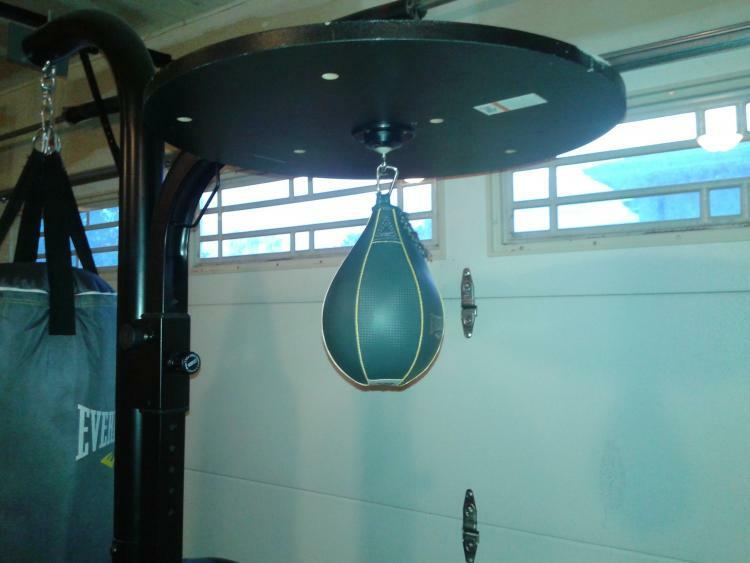 The convenience of the heavy bag stand allows you to place the heavy bag in a location that may not be appropriate with the traditional method of hanging it from the ceiling. Before you start the assembly process, make sure you have all the pieces required and the space needed to work on it. Additionally, evaluate all the parts for any damaged or defective goods. The metal structure of the heavy bag stand requires you to slide the main metal tubing onto the base portion. Make sure the designated room has a ceiling that can handle the height of the stand as well as have enough clearance for sliding the top metal tubing on. Otherwise, you have to lean the base structure off the ground to complete this step. Body Tubing: Due to the structure of the stand consisting of thin hollow metal tubings, the long term durability is questionable. When throwing a hard strike to the heavy bag and driving it towards the stand structure, it shakes quite a bit. These metal tubing could be thicker and sturdier. However, the metal construction of the stand has shown to be durable enough so far. Heavy Bag: The heavy bag has been exceptional in its ability to withstand the abuse inflicted on it. 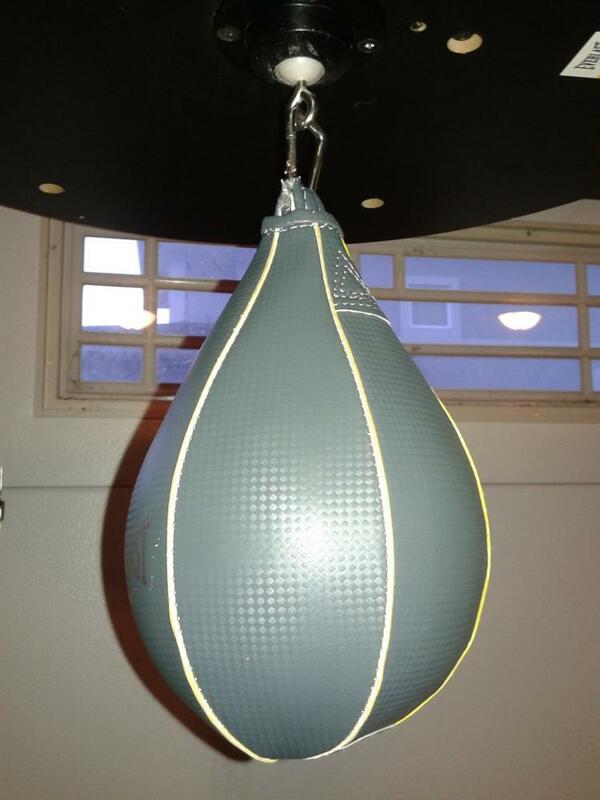 Speed Bag: The speed bag looks cool and it has shown to be durable as well. The one negative aspect of the Everhide speed bag is that it does have a tendency to deflate quite fast over time, even when not in use. Speed Bag Swivel: The swivel part is only ok. It definitely can be upgraded to a more quality option if you are unsatisfied with it. Speed Bag Platform: The speed bag platform is quite flimsy. You have to hit the speed bag parallel to the platform’s support beam. Else, the platform will vibrate uncontrollably and throw the rhythm of the speed bag off. Alternatively, you can switch out this platform for a better hardwood selection. If you do not have the proper weight plates, make sure there is enough room between the stand and any nearby wall to avoid unnecessary damages. Since the maximum heavy bag weight supported is 100 lbs., the bag will swing and bang hard against the structure of the stand. The image below displays my heavy bag station positioned accordingly. For my setup, I have 15 lbs. on each of the front two pegs and 50 lbs. on the third peg. These weights are fine for working on technical striking, but bigger individuals may want to add weight up to the recommended amount to maximize the stand’s stability. Besides throwing punches, you can practice various kicks, knees and elbow strikes. The heavy bag stand does limit you to straightforward strikes and will not allow you to work at different angles. Furthermore, the support bars on the side makes it risky to throw roundhouse kicks. Overall, the Everlast Dual Station bundle is a great buy because of its cost and convenience. It is excellent for home use and is hassle free after assembly. You do not have to worry about damaging or putting stress on your house, unlike the traditional method of hanging a heavy bag from the ceiling. An important thing to note for first time heavy bag owners: Be mindful to lay the heavy bag horizontally on the ground when you are not consistently using it. Otherwise, the content within the bag settles to the bottom and makes the bottom portion rock hard while the rest of the bag becomes soft.